Parking: Enter off The Grove Drive. 1 hour free. Parking rates rates are odd after that. Valet parking is also available. Note: The Grove forms a contiguous shopping area with the historic Los Angeles Farmers Market, but they don't cross-validate parking, so be sure to get validated for where you parked. The Grove is an upscale outdoor shopping mall located next to the Farmer's Market in the Fairfax District of Los Angeles just south of CBS Television City. It is relatively small as LA shopping malls go, with about 45 businesses, which makes it easier to navigate, and it makes up in ambiance whatever it may lack in size. 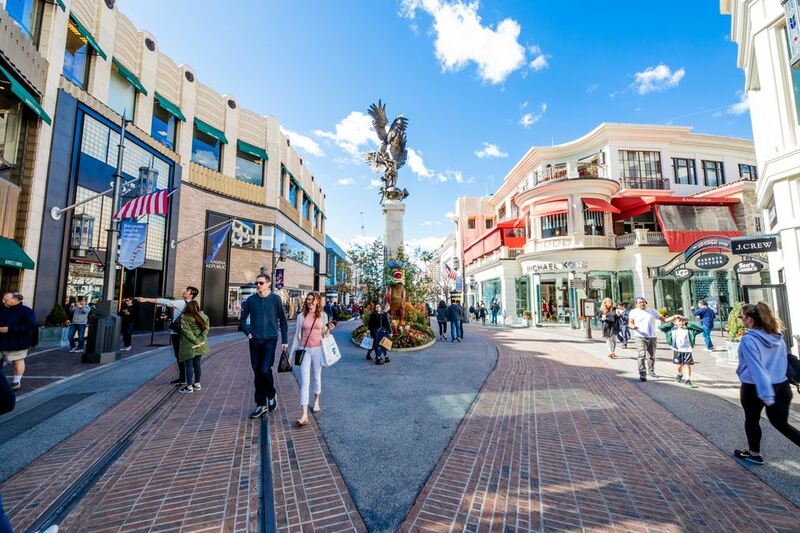 The Grove includes a combination of designer fashions and mid-range retail, popular restaurants and a movie theater in a crisscross of pedestrian boulevards lined with facades inspired by art deco and old Europe. Patio and balcony dining overlook the Dancing Fountain in the courtyard. Some highlights of The Grove include the first west coast American Girl Place, an Apple Store and the Barnes and Noble with the most celebrity book signings in town. An outdoor stage hosts everything from concerts and movies to Cirque du Soleil previews. The anchor department store is a Nordtroms with personal fashion and beauty stylists and alterations to get you ready top to toe for big events. Other shops range from classics like Barneys New York and Diane von Furstenburg to trendsetters like Brandy Melville. A green double-decker Trolley built on the undercarriage of a 1950s Boston street car can give you a free lift along the 1/4 mile stretch from the middle of the Los Angeles Farmers Market to the middle of the Grove. If your hotel doesn't offer concierge services, the Grove's concierge can help you out with dinner reservations, personal shopping, tourist information and even check your packages so you don't have to carry them around with you. The historic green trolley runs between the Grove and the LA Farmers Market. The lanes of The Grove were specifically created to accommodate the old trolley, taking visitors back and forth in time from LA's past to its present. American Girl Place at the Grove in Los Angeles is a little girl's dream, not just for the dolls that look like everyone, but also for the opportunity to have tea with your doll or a borrowed one in the American Girl Cafe. The Spirit of Los Angeles Statue created by sculptor De L’Esprie, shows male and female angels reaching to the heavens. The 18-foot sculpture stands on a 22-foot column at The Grove shopping center in Los Angeles. The spinning marquee of the art-deco-inspired movie theater is designed to be seen from anywhere in the mall. Forever 21 with the stained glass street lights at The Grove shopping center in Los Angeles. Twilight is a great time to appreciate the architecture and lighting features of The Grove, including the neon on the Pacific Theatres tower. Morels French Steakhouse & Bistro at The Grove is a popular spot for dining and celebrity spotting in Los Angeles. The Dancing Fountain at the Grove is lit up at night. It's also a nice spot to take a shopping break during the day. Summer movies on the lawn and concerts at The Grove are a mainstay of summer entertainment in Los Angeles. Check The Grove Calendar for upcoming events.